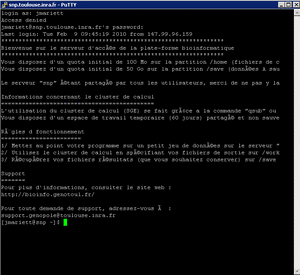 All systems implementing SSH can be used to connect your self to genologin.toulouse.inra.fr (Windows, Linux, MacOS). You access the platform via a command line SSH connection (putty for Windows). To access via SSH, you must have a user account. Connect to the platform under MS-Windows? Download Xming and Putty. Only the Xming installation requires administrator rights.Launch putty by double-clicking on the icone. Once started, fill in the Host Name by genologin.toulouse.inra.fr. Enter your unix login and password (use this page to ask for an account) You are now in your Unix environment. For more information about the configuration of putty refer to the online documentation . Transfer your files using a secure program such as WinSCP or Filezilla. With Filezilla you have to set the transfer port to 22. Frame 1 corresponds to the directory tree on your local desktop. Frame 2 corresponds to your directory tree on genologin.toulouse.inra.fr. To transfer files drag them from one frame to the other. Add your mail address here . You can see your account information on our SelfService.